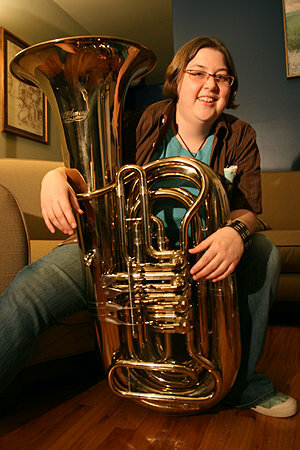 Carrie Frederick and I have been playing together on our brass instruments for years, so I know what they can do on the tuba, and writing for their instrument has been super fun. Carrie has performed with lots of ensembles, including chamber groups, large wind ensembles, orchestras, and jazz bands. Currently they play with Ain’t Misbehavin’, a traditional dixieland band, as well as our group the Brazen Brass.